"Soka is committed to investing its resources to ensure the success of our students, making education accessible and affordable"
Meeting the costs of higher education represents a significant investment for most families. At Soka University of America we are committed to taking on a partnership to help you along the way. The Office of Financial Aid partners with students and families in order to ensure that Soka education is accessible to all students who are admitted. In an effort to promote greater diversity and access, SUA has designed a comprehensive merit and need-based financial aid program that ensures the fair distribution of institutional, state, and federal funds. 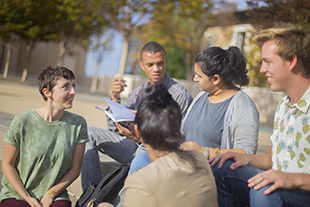 Soka is committed to investing its resources to ensure the success of our students. Use our Net-Price Calculator to obtain your financial aid award estimates today! First Year and First Year International cost of attendance breakdowns (E.g. tuition, room and board, etc.) are available and can be found within the Financial Aid pages. Questions regarding cost of attendance can be sent to financialaid@soka.edu.